The World\’s Largest Animated Man, in Brainerd MN. The world’s largest animated man, on the world’s largest flushing toilet. I haven’t been to brainerd in a while, but I don’t remember this one. I really wanted to do “Reanimated Paul Bunyon,” but I’ve found the right picture yet… plus this kinda ruins the moment. oh well. there should be a “not” in that last post. So, this Paul Bunyan can move? Doesn’t look like it to me. If it can’t move it ISN’T annimated, sorry. His mouth moves and his head looks around. 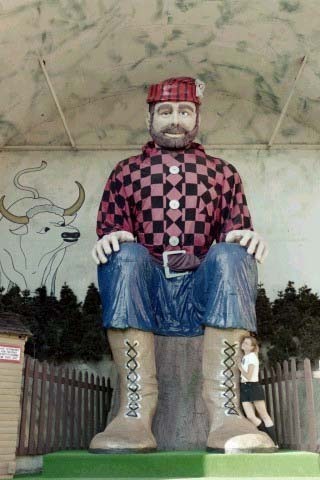 Its at a Paul Bunyan Theme park that has since closed down. I used to go there all the time as a kid. Dirty! Now I have to come up with something else for theme day. Oh, Tiki, why-I-oughta! I prefer Bemidji’s statue, despite the lack of animation. This isn’t in Fargo. And it isn’t really animated, but they ask for your name at the front gate, and as you walk past the statue, it will talk to you. This freaked my youngest daughter out. The look on his face tells me that he just dropped a deuce.